Sam “Lightnin'” Hopkins was a bluesman who carried on the old country cotton-field style of the early Texas blues. In fact, blues historian Samuel Charters has called Hopkins the last of the old country bluesmen. Hopkins had a rough, unpolished singing style that remained pretty much the same throughout his career of more than 50 years. However, he had a highly expressive blues voice, full of nuances and subtle tensions that, when answered by bursts of single-note runs on his guitar, created a compelling effect. Sam Hopkins was born March 15, 1912, in Centerville, Texas. Several members of his family were musicians, including cousins Alger “Texas” Alexander and Albert Collins. Hopkins left home while still a teenager to hobo throughout Texas, working whenever he could, which included playing for tips in saloons. It was during these days of rambling that he teamed up with his cousin Alger “Texas” Alexander. Alexander was one of the very few bluesmen who only sang and didn’t play an instrument. He was always on the lookout for an accompanist and usually carried a guitar in a case with him on the chance that he might meet somebody who could play for him. For a while, Lightnin’ filled that slot. They worked the streets of Houston, with frequent trips through East Texas, playing in juke-joints and dives. But this was the middle of the Depression, and times were hard. Lightnin’ became discouraged and decided to go back to the farm. He didn’t return to Houston until 1945. For a while, he worked with a barrelhouse piano player, Wilson Smith, who used the name “Thunder” Smith when performing. This is how Hopkins got the name “Lightnin’.” They were sent to California by an agent for Aladdin Records. They made some records that were released under the names Thunder Smith and Lightnin’ Hopkins. They stayed on the West Coast for a while, working clubs and dance halls, but before long returned to Houston where Lightnin’ was to become the most important figure in the blues joints of that town for years to come. Hopkins imposed his own style on the blues scene, and it is largely through his presence that Houston became a big blues town. 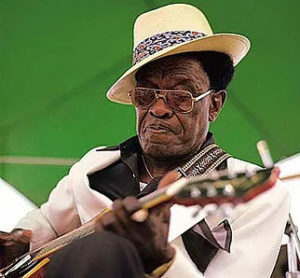 By the mid-50’s, Lightnin’ Hopkins’ popularity was waning, and, like most of the old-time bluesmen, he was losing out to the new Chicago blues bands. By 1959, Lightnin’ had disappeared from the blues scene. However, he was brought back in the mid-60’s by the surge of interest in folk music that was then sweeping the country. With this new audience, he gained wide recognition and was a popular performer on the coffeehouse, college campuses and folk festival circuits. Lightnin’ recorded hundreds of times for a variety of labels. Many of the smaller companies produced inferior products, and Lightnin’s performances were often uneven, resulting in records that were often of poor quality. But his better recordings, especially those he made for Arhoolie in the mid-60’s, present Lightnin’ at his very best and offer some of the best blues sounds ever recorded. Lightnin’ continued to play concerts and record until his death a few years ago.